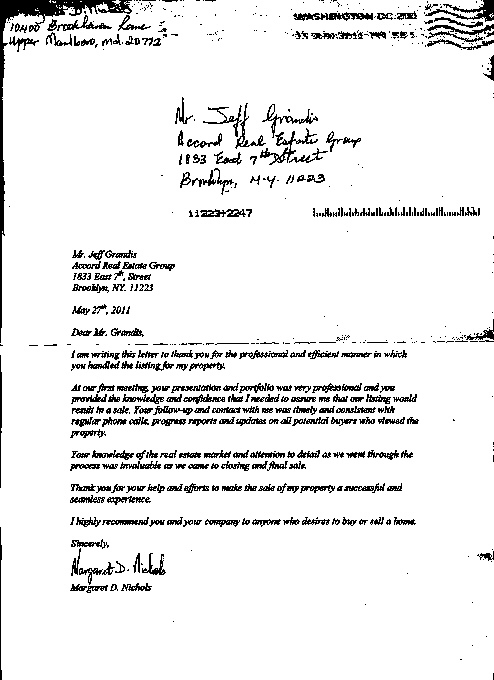 I am writing this letter to thank you for the professional and efficient manner in which you handled the listing for my property. to assure me that our listing would result in a sale. Your follow-up and contact with me was timely and consistent with regular phone calls, progress reports and updates on all potential buyers who viewed the property. Your knowledge of the real estate market and attention to detail as we went through the process was invaluable as we came to closing and final sale. Thank you for your help and efforts to make the sale of my property a successful and seamless experience. I highly recommend you and your company to anyone who desires to buy or sale a home.